Duke Energy announced contracts Wednesday for 602 megawatts of utility-scale solar under a statewide competitive procurement in North Carolina — with nearly half of the projects to be built by Duke or its own subsidiaries. Unlike utilities in California and many other states, Duke is allowed to compete against other developers to meet North Carolina's renewable energy targets. Duke is North Carolina's largest utility, and among the largest investor-owned utilities in the country. It's also a major renewables developer across the country through its independent generation arm, Duke Energy Renewables. North Carolina’s competitive renewables procurement program allows the state's targets to be met through power-purchase agreements, utility self-developed facilities or outright utility asset acquisitions. To avoid the obvious potential for conflicts of interest, North Carolina used independent administrator Accion Group to select winning projects from the 78 submitted. Of the 14 winning projects announced, six are to be built by Duke entities, while the remaining will be built by developers not identified in the release. Duke's own projects, sited in North Carolina, will be built by three company divisions: Renewables, Energy Carolinas and Energy Progress. Duke's six projects add up to 270 megawatts and are expected to be complete by 2020. While Duke didn’t reveal cost figures in its Wednesday press release, a report from Accion Group provided some data points on the capital costs and energy costs involved. The report noted that the average energy price per proposal was $36.93 per megawatt-hour for North Carolina projects and $31.24 per megawatt-hour for South Carolina projects — both lower than the cost of solar prior to the program’s launch. Duke noted that these avoided-cost savings are expected to add up to about $375 million over the projects’ 20-year contract period. Accion Group’s report estimated the capital costs of the projects at $1 million to $1.5 million per megawatt, excluding land costs. Applied to the contracted solar for both North and South Carolina, the report estimated the projects’ capital costs will be between $515 million and $773 million for the 515 megawatts of solar to be built in North Carolina, and between $87 million and $131 million for the 87 megawatts to be built in South Carolina. In terms of Duke’s 270 megawatts of projects, the figure would be between $270 million and $405 million. HB 589, the 2017 law that created North Carolina's competitive renewables procurement program, sets a variety of new solar market mechanisms in place, designed by its backers to pass muster in the state’s Republican-dominated state legislature. 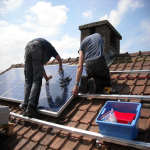 Those included the competitive solar solicitations just announced, as well as a statewide rooftop solar leasing program, and the Green Source Rider Program, which allows large utility customers to offset their electricity usage with renewable energy. Duke Energy is a big player in renewable energy development outside its regulated markets. But the utility group has also been a long-time proponent of giving its in-house regulated utilities some role in owning the assets that make up a modern, renewable energy-powered grid, such as grid-tied batteries, electric vehicle charging infrastructure, microgrids, and some behind-the-meter assets. Last year, the utility sought permission to enter the North Carolina commercial solar rooftop leasing market through a non-regulated subsidiary — a move that would meet with fierce opposition from third-party developers in California, but which in North Carolina could be seen as a way for Duke to boost a market that’s still in its infancy. North Carolina continued to lead all states except California in terms of solar market growth in 2018, according to last month’s U.S. Solar Market Insight 2018 Year in Review report from Wood Mackenzie Power & Renewables and the Solar Energy Industries Association.